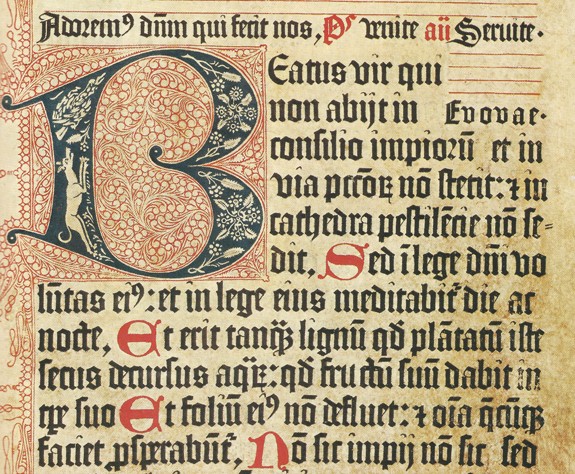 Even before Gutenberg invented the craft of typography, fancy initials were used to begin chapters and decorate pages in medieval manuscripts. And while Gutenberg didn’t create initial letters to complement his fonts, he did leave a space in his typeset pages so these typographic embellishments could later be drawn in by hand. The oldest initial form is the drop cap. Here the initial letter is set down within the copy, not rising above the top line of text. The other style is a raised initial. 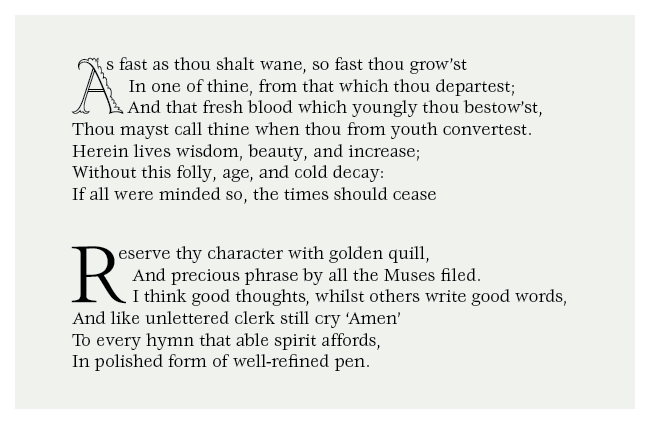 This variety rests on the baseline of the first line of copy and rises above the top of the text block. Dropped initials should align optically with the top of the opening word or words and appear to align with a line of the text copy. 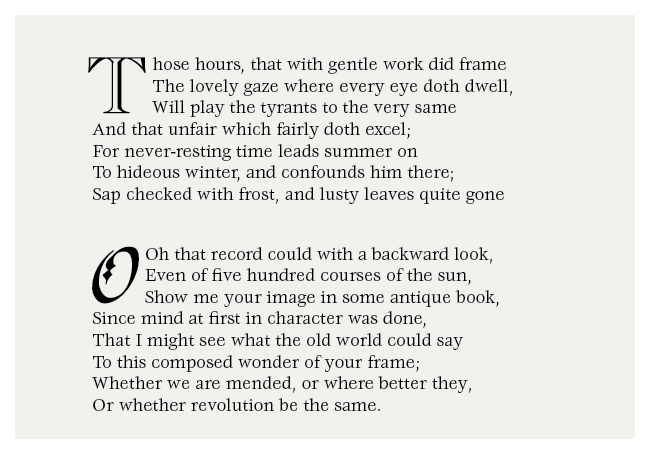 With most dropped initials, lines of surrounding text copy are aligned vertically with just enough indent to provide snug spacing between the initial and the lines of copy it adjoins. (This is usually less than the line spacing.) As with most things typographic, however, there can be exceptions to this guideline. Sometimes letters like A, L, R, or even an E, may require special handling. When using initial letters with irregular right sides, the first line of the paragraph is usually brought in close to the letter, and the lines that follow are aligned with the right side of its body. Line beginnings can also hug the right side of the initial letter. Some letters should be set overhanging the left edge of the text block. Words that begin with initial letters are also frequently completed with capitals. While this isn’t necessary, it makes the transition from large initial letter to text-size lowercase characters smoother. When the first word has only one or two letters, it may facilitate the transition to use capitals for the second word as well. If Initial letters are in boxes, the space to the right of the box should be optically the same as the text line space. Beginning quote marks should be between the size of the text copy and the initial letter. Sometimes initials are set very large and serve as an oversized graphic introduction to a page. These can be very striking but, if they are too big or too far away from the text letters that follow them, readability can be impaired. It’s OK to be creative with initials. Try using a lowercase letter instead of a capital. The initial can be put into a plain box or circle. Initials can be hand-drawn; they can be exceptionally decorative or very simple. They just need to look good.